One of the things that has bothered me the most about my green cabinets has been the wood grain in the cabinet doors. These cabinets are oak, and wood grain in oak is very visible and deep compared to most other wood species. And during the mid afternoon when the sunlight in the kitchen is the brightest, the grain is so prominent on the cabinet doors that it actually looks like some of them have a subtle decorative pattern painted on them. Before repainting them, I wanted to fill the grain so that it would at least be dramatically minimized. On oak with really deep grain, I think it might be almost impossible to make the grain completely disappear, but I’ll be happy with just minimizing it. 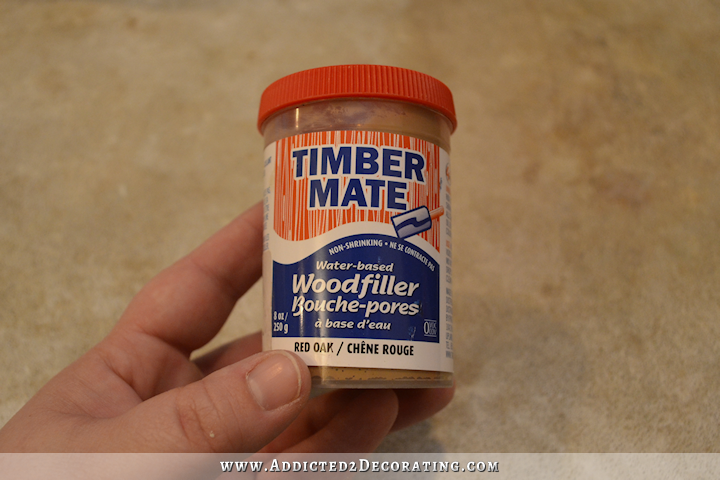 To fill the grain, I used this wood filler called Timber Mate, which you can find here on Amazon*. Anyway, I just scooped out a big spoonful into a bowl, and then added some water and mixed it up until I had a thick paste. 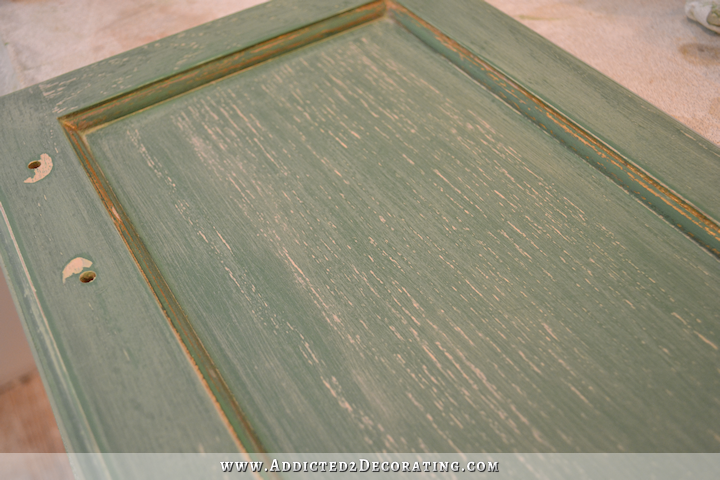 And after lightly sanding the cabinet door with 150-grit sandpaper, I brushed the paste over the entire surface. I put it in front of a box fan, and it took about 30 minutes or so to dry. Then I used 150-grit sandpaper to sand the entire surface. You can see here how the Timbermate settled into the wood grain. I don’t have a door that’s completely dry yet, but when I do, I’ll take a picture and add it to this post to show you the difference. Now again, it doesn’t make the grain go away completely on this type of oak that has such heavy, deep graining. But it does minimize considerably. Of course, you can add another coat and sand again. That would probably help even more. 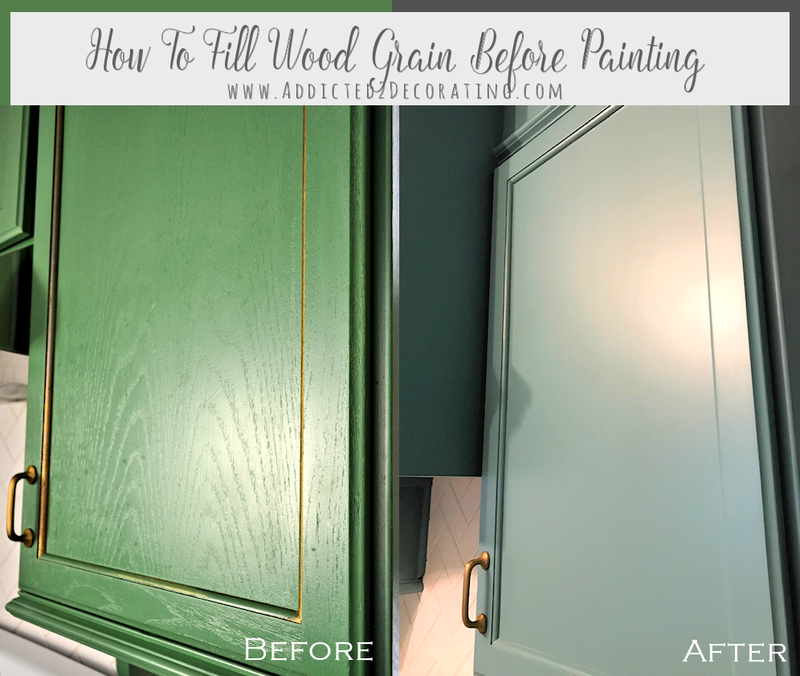 Another thing that helps to minimize the grain even further is to paint the cabinets with a paint brush instead of spraying. I love my Critter sprayer* and use it when I can. It makes painting cabinets and furniture so much faster and easier. But when it comes to oak, I’ve noticed that actually dragging a brush across the surface pushes the paint down into the grain and fills it more, where spraying doesn’t really have the force to push paint into the grain, so it actually accents it more. 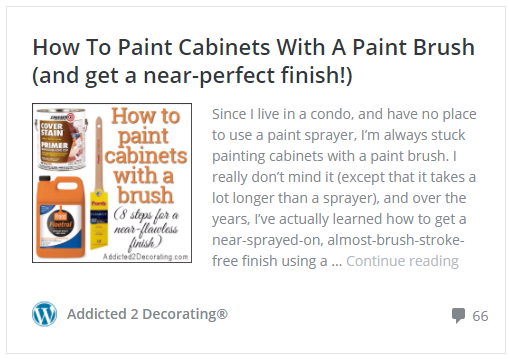 If you get nervous at the thought of painting cabinets with a brush, I’ve written about my process and my painting tips here. Always excited to see progress! 🙂 Keep up the good work! 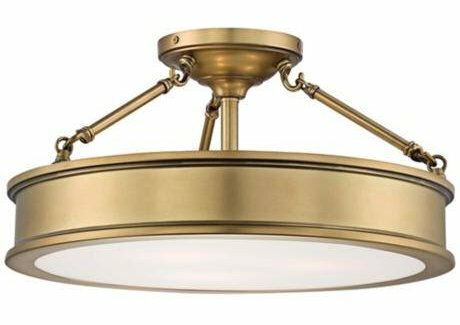 Now that you have a decorating plan in mind for all of the main areas of your house, it probably won’t feel like “jumping around” so much. It’s almost like you’re just working on the different components of one big space. Will you be posting an inspiration board or anything? Or just keep surprising us? Either way works for me! Best way to do it because otherwise you will have to many opinion’s floating around.!! Jumping around from room to room, you won’t get bored being in one place too long! A cat? They made you dissect a cat??? I think I’m going to cry. Agree. We dissected frogs in high school but not cats. I would not want to dissect a cat. I love my cats so much. Betsy must be younger than I am- we definitely had to dissect a cat! Florida high school in the 70’s. I’m so interested in what the uppers will look like and if you will think that revere pewter translates as more of a gray (which you don’t like but I do) after the Gentlemans Gray on the lowers. 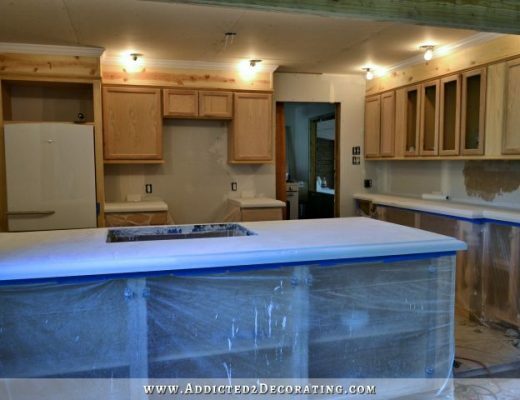 What brand/ type of paint are u using for the cabinets? I’ve now seen it at all times of the day, and it still doesn’t look gray to me. We’ll see how it looks with the blue, but in my house, in my lighting, it has too much brown to be gray. I really have an aversion to cool grays, though. So even if it does look a bit grayer with the lowers painted blue, there’s no way this paint color could ever look cool gray. You’re lucky. I painted my upper cabinets Revere Pewter and the lowers BM Copley Gray and the uppers look like a very cool gray to me, almost bluish at times. I haven’t replaced my counter top or the back splash yet so I’m hoping that helps. I have warm colors in the room as well though, so I’m sure that makes a difference too! I’m using Benjamin Moore Advance in a satin finish on the cabinets. Looking forward to the “filling” of the oak grain. I have never tried filling / painting oak. As luck would have it, I really need instruction on this as I have several oak pieces that I want to paint. When you say you sand things, do you mean with an electric sander? Or do you do it by hand? I sanded these by hand. Pro’s often spray then follow with a roller or brush for exactly the reasons you are describing. Faster and better coverage. Follow immediately? Or after they’ve dried? 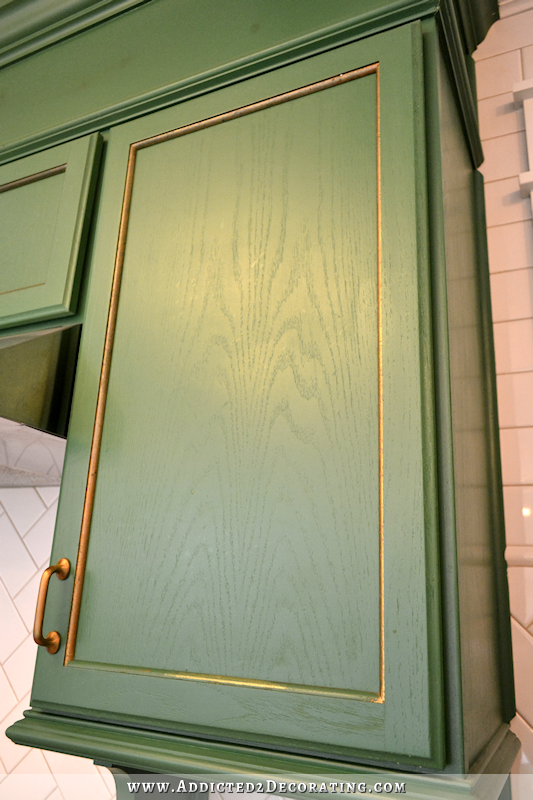 I thought the oak grain on the green painted cabinets looked pretty nice. It was kind of showing off that the cabinets were a nice hardwood and not a engineered wood product. I think when you use high quality building materials, why not show off what you’ve got? But, this was a neat post, showing us what this timbermate product is. I always learn alot from this blog. I have no doubt the cabinets will turn out wonderful. Can Timbermate be used outside? I’m actually not sure. It’s water-based, but I think as long as it’s coated with a water/weather proof paint it should be fine. Oak’s aggressive grain is why I would advise against using it for surfaces you are going to paint. Yep high schools in FL dissected the cat too. Even in the late 80s. I thought I understood what you meant when you’d mentioned the grain showing through… but I didn’t expect it to be visible that much! It’ll be very interesting to see the after with the Timbermate. A somewhat related question. I have a terribly scarred/marked up cherry wood top table that is stained. The base of the table and chairs is painted black. I don’t want to restain it – would rather keep it more natural looking and if it’s going to get beaten up (homework/drop zone) what could I do rather than painting it? I think it’s just the finish that’s all beaten up, so not sure wood filler would be appropriate. TIA! So the top is stained and the base is painted black? And is it just the top that’s scarred, or just the base that’s scarred, or both? If it’s just the stained top, and you don’t want to go to the trouble of sanding and refinishing, you might try one of those products from Home Depot or Lowe’s that says it refreshes the finish without having to strip. I’ve never tried it myself, but I’ve heard good things about them. If it’s the base that’s scarred, then you can just sand the scarred areas and feather out the sanded edges so that they blend in with the painted areas around them. Then repaint. Although you might have to prime first if the sanding exposes bare wood. I guess I wonder why you went the oak cabinet route in the first place. Was oak less expensive than maple or cherry? Yep, I used in-stock unfinished oak cabinets. 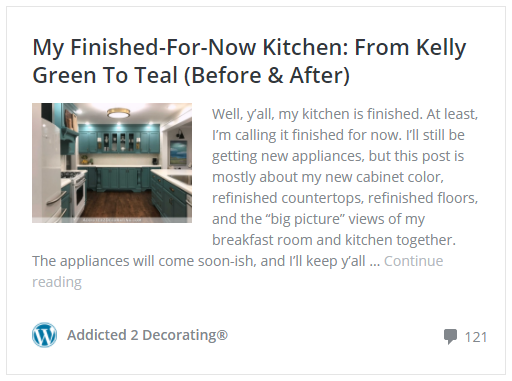 When I remodeled my kitchen, I didn’t really cook, and wasn’t intending to spend much time in the kitchen, so I didn’t want to spend much money on the remodel. I regret that now since shortly after remodeling the kitchen, I started cooking quite a bit, and I use my kitchen every single day now. But yes, the in-stock unfinished oak cabinets from Home Depot are very inexpensive. I love your new colors. I have also purchased for myself a Dremel multimax 45; a dremel hand tool and case; an air compressor with one 16 gague nailer. I am waiting to purchase a stapler to purchase one for upholstery with a longer-ish nose. I purchased a used Dewalt miter saw from my neighbor. Almost ready to go!! First now on Friday, I am leaving for a 13-week assignment in Brooklyn to work. My fun stuff is put off a little longer. Thank you for your inspiration and example. I know I can do all this stuff. It just takes me a little longer than most! HaaH!! Please tell me what came of your weight loss endeavors and the HCG?? I am so wondering about that and need your input and opinion and experience. Thank you. I admire you so very much. Sincerely Barbara Dunlop. After reading your posts on the Critter Sprayer, I purchased one. I have been having trouble getting it to work for me. I’m sure it’s operator error. I used the Floetrol to help with the viscosity of the paint, but my sprayer would work for a few minutes, and then clog again. Do you have any suggestions? Do you thin your paint down further with water? I’ve adjusted the pressure and the nozzle height with very little positive results. Just ordered a different sprayer, but I can return if I’m able to get the Critter working properly. 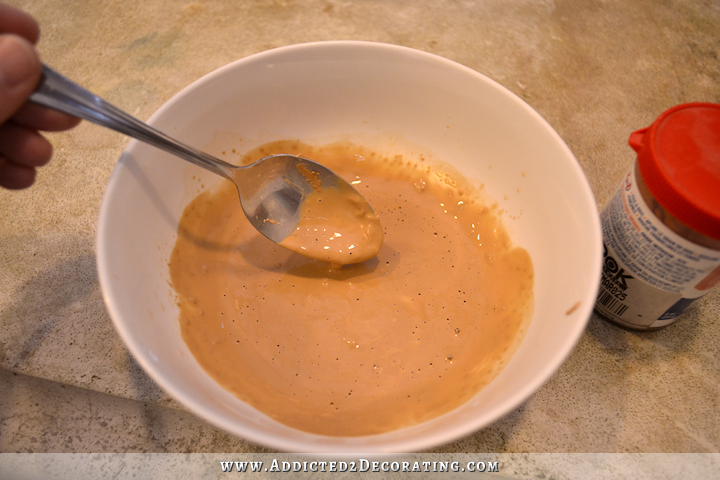 Do you strain your paint as you pour it into the glass jar? The only time I’ve ever had mine clog is when I forgot to strain the paint. It makes a big difference. I buy the paper cone strainers at Home Depot that come in a 4-pack. Oh, and no, I don’t water my paint down. I pour it straight out of the can, through the strainer and into the jar. Hi, I was just googling around to see what others were doing to achieve what I’m trying to achieve right now. Just as another option from the wood filler you’re using, Durham’s water putty is made to fill surfaces that’s about to be painted and it comes in 4 pound cans for just $4 (on Amazon at least right now). I learned about this stuff about 2 years ago and I love it. You can make it as dense or viscus as you like and when it cures it’s rock hard. It fills our oak cabinet grain really well. This method is just a bit labor intensive lol. Stunning. Thank you so much for posting! I’m going to order this and use it when I do my cabinets. Wonderful post. I’m wondering, do you have to apply a primer AFTER you apply the wood grain filler? 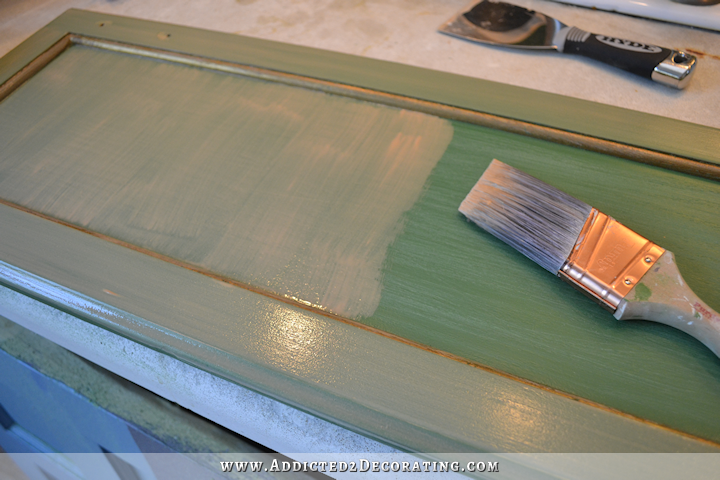 I am also applying the wood grain to prepainted oak cabinets. Thanks! I was wondering if you primed after the wood filler step? I am repainting oak cabinets black that were previously painted black by another home owner but want to try the wood filler first. Thanks! I started primning on the first cabinet doors that I did, and then I got lazy after doing a few and stopped priming and just went directly to painting. I couldn’t tell a difference. I did use a high quality paint (Benjamin Moore Advance) and I also did two coats of paint. So you might just test on one door and see if you need primer. 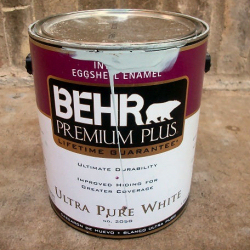 If you skip the primer, you’ll just want to be sure that you’re using the same kind of paint. In other words, you won’t want to put latex paint right over oil-based paint. You’d need to prime first. I am just wondering how the wood filler has held up? Any cracking? I just followed your process to fill in wood grain on a project I am working on. Thanks for the tutorial! Mine has held up perfectly. No cracking at all.